Fully adjustable pentagram garter belt made with satin elastic and silver sliders. 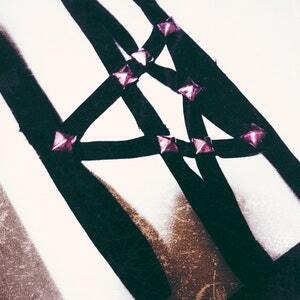 Pentagram harness style with silver spikes. *Made to order. Allow 5-7 business days to ship out. *If you would like a custom size, leave your waist, hip, and upper thigh measurements at checkout in the note section. Main photo by New York Trendz. I won't start working on an order until full payment is accepted. I do offer payment plans for certain items (sets only). When ordering please leave your measurements in the note section. See individual listings for measurement details. If you fail to include your measurements and don't get it to me within 3 days of ordering, I will make and mail out any size. This is to insure the customer gets their order in a timely manner and to avoid work pile up for me. All orders are sent through the US postal service. Most items are sent with first class mail. If you would like priority shipping 2-3 day or priority express, select shipping upgrades at checkout. If you need your order by a specific date, please let me know before ordering. All orders are sent through USPS first class international shipping. **I am not responsible for any additional custom charges that may apply. All orders have tracking. Once shipped, you will receive an email with the tracking info. If for some reason it doesn't fit, you can send it back to me so I can modify it. International orders will be responsible for shipping costs. What kind of material is your body cage wear made of? All body cage wear is made from high quality elastic, lace, and chiffon fabric. Can body cage wear be washed? I recommend spot cleaning or hand washing body cage wear. For any items from the Bathory Collection, I do not recommend washing since the red paint may come off. When will my order ship? How will it be shipped? All items are handmade and made to order. All body cage wear ships out in 7-10 business days, depending on my workload. Sets anywhere from 1-2 weeks. If you need your order by a specific date, please let me know before you order. All US orders are sent through USPS with tracking. Once shipped, you will receive an email with tracking info. International orders are sent through USPS first class international service. Not all international orders will have tracking. What kind of measurements are needed? For cage bras, your under bust and cup size are needed. For harnesses, your under bust and over bust. Garters, your upper thigh measurement. Gloves, your glove size. Due to the intimate nature of body cage wear and since everything is made to fit each customer, I do not offer refunds or exchanges. If for some reason your item(s) doesn't fit, you can send it back to me so I can fix it. Are you looking for models or photographers? I am not looking to collaborate with anymore models. I am also a model and find it easier to just shoot in the items myself. Can I use your harnesses and cage bras for suspensions? No! Please do not use any of my items for suspensions. All items are made for fashion and light play purposes only. Sinister Designs is not responsible for any injuries. All items are made to order and made to fit you. See product descriptions for measurements that are needed. Any questions about sizing, feel free to send me a message. Yes, I can make a custom order. Just message me your idea and I will see if I can make it for you. Spot clean or hand wash except for blood splattered items. The paint may wash off.